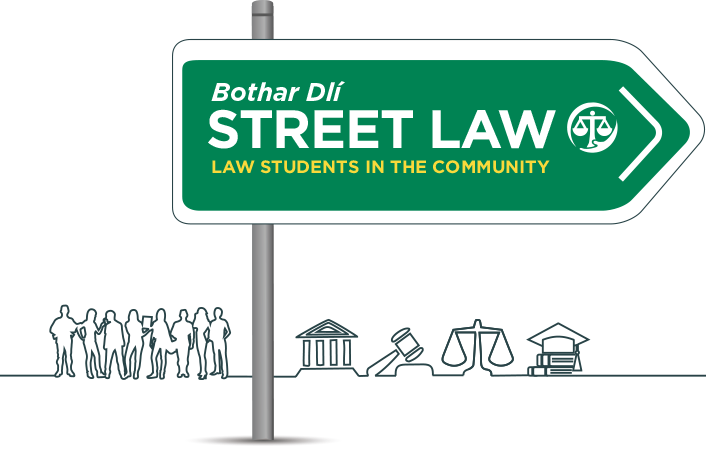 Street Law is a form of legal education that involves law students teaching practical law using a wide range of interactive teaching methodologies. This encourages law students to be active participants in their own learning. It is a form of public legal education or pro bono and is used to bring legal information into schools, prisons, homeless shelters and other community settings. Street Law classes can be distinguished from the traditional teaching methods in legal education. In putting theory into practice, Street Law simultaneously aims to develop and enhance the professional development of law students while introducing their audience to law and the legal system through discussion, role-play and other interactive methods. The educational experience for all is enhanced by the ‘do more – teach less’ strategy, building skills and confidence to bring about positive change and develop a broader understanding of their legal rights and responsibilities. The Street Law approach requires the law students to create problem solving opportunities and provide practical information to their audience through which their audience develop knowledge and skills about the law and how it affects their daily lives. The interactive methods used in Street Law combine legal content with innovative hands-on teaching strategies that actively engage both the law student facilitators and their audience in the learning process. Competency building activities are designed to provide the audience with the ability to analyse and evaluate legal situations, developing their confidence and communication skills. Street law is designed to provide participants with an understanding of their legal rights and obligations and to teach the fundamental principles that underlie our legal system. This is intended to enable participants to use their knowledge to address their own real life problems and motivate them to become active participants in society with a positive attitude towards the law. Street law is about building “Belief, Capacity and Community” (The Law Society of Ireland).